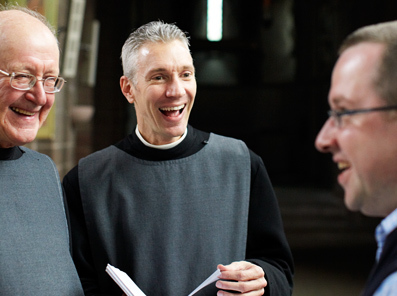 Student life at the College of the Resurrection is heavily influenced by the pattern of life in the Community of the Resurrection, the monastic order with which we are interconnected. The brothers’ rhythm of life brings an extraordinary depth and richness to our own prayer and liturgy, study and theological reflection. The result is a life pattern which sustains and develops our graduates long after they have left us. Past students repeatedly single out the connection with the community as having been the most significant aspect of their time with us. This monastic rhythm of life teaches us the importance of a harmonious balance between prayer, study, work, rest, and hospitality. The brothers pray privately for half an hour each day in addition to following a monastic routine of corporate prayer and worship. Each day is structured around Mattins, a short midday office with the Eucharist; and evensong. After a quiet compline, complete silence is observed until 9am the following day. Every Monday to Friday the college day begins at 7:30am with mattins; we celebrate the Eucharist immediately after mattins, and then we join the monastic community for evensong at 6.00pm. On Thursday evenings the whole college gathers to celebrate the Eucharist. On Sundays, we join the brothers for mattins at 7.30am and the Sunday Eucharist; then ordinands often go to a placement in a local parish. Sharing meals is an important part of life in any community. In term-time, our refectory provides three meals a day, seven days a week, and spouses, children and guests are most welcome. Eating together is an important expression of our common life. Christian spiritual life has always valued silence as a medium within which we can discover our essential dependence on God and also, paradoxically, as a way to learn to listen better to one another. One feature of our life together which many students particularly value is that we start our day in college in silence, and from time to time we have silent days.